Gibsonton Fl. -TAMPA, FL – Jimmy Owens of Newport, TN ended his spectacular 2007 season in “killer” fashion on Saturday night by winning his second Crate Racin’ USA World Championship Race for the StormPay.com Dirt Late Model Series and the $10,000 top prize driving the VP Racing Fuel Warrior at East Bay Raceway Park. Owens now has a trophy to go with his 2005 win. Owens took the lead on lap 90, but five laps earlier he was beginning to accept a third-place finish. Randy Korte of Highland, IL dominated the race, but he fell out while leading the race on lap 86 when something broke in the front end of his B&B Precision Mowing Rocket. That gave the lead to Stacey Roberts of Sylvester, GA in the Sunbelt Ford Rocket followed by Owens. Roberts found his own disaster on lap 90 when the driveshaft departed his race car in turn one. That gave the lead to Owens, who led the rest of the way, despite a late race challenge from Doug Horton of Bruceton Mills , WV in the SWS First Response Warrior. Horton had to settle for second, and Frankie Beard of Hartwell, GA moved up to finish in the third spot in the Freeman Plumbing Mastersbilt after the apparent third-place finisher Randy Weaver of Crossville, TN came up light at scales after the race in the Hicks and Ingles Mechanical Contactors Warrior. Todd Morrow of Old Fort, TN finished fourth in the Coggin Lawn Service Warrior, and Anthony White of Clinton, TN charged up from the 20th starting position in the Trade Mark Metals DWB to round out the top five. 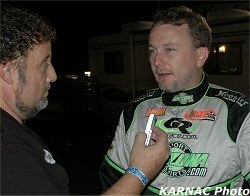 Shanon Buckingham of Morristown , TN was sixth in the Rusty Wallace Toyota Barry Wright. Derrick Rainey of Powder Springs, GA took the seventh spot in the Hays Family Racing Warrior, and Jeff Fields of Aragon, GA finished eighth in the Summerville Junkyard Mastersbilt. Ken Schrader of Fenton, MO was ninth in the Red Barron Pizza Rocket, and Steve Mathis of Plant City, FL rounded out the top ten in the Mathis Farms Rayburn . Owens grabbed the lead at the drop of the green flag from the pole position to start the race, but John Pursley of Clover, SC spun his Carolina Lawn Mastersbilt in turn two, collecting Keith Nosbisch of Valrico, FL in the Adams Used Auto Parts Rocket and Rainey. Pursley and Rainey lined up for the complete restart, but Nosbisch was done for the night. Front row starters Owens and Roberts battled side-by-side for the lead on the restart in turns one and two, but it was Roberts taking the lead down the backstretch. Owens, Korte, Nick Lyons of Centrailia, IL in the Mott Excavating Forward, and Weaver trailed Roberts in the opening laps. Stephen Rogers of Knoxville, TN in the Warrior Race Cars “house car” spun in turn two, collecting Jack Nosbisch Jr. of Riverview, FL in the Adams Used Auto Parts Rocket. After the restart, Weaver got by Lyons for the fourth spot on lap five, and Horton followed Weaver past Lyons and into the fifth spot in lap six. Korte passed Owens for the second spot on lap eight and Roberts began to encounter lapped traffic by the tenth lap. With Roberts trying to negotiate through lapped traffic, Korte and Owens quickly closed to make it a three-car battle for the lead. As the lead trio came off the fourth turn to complete lap 12, they went three-wide for the point. Korte stepped to the outside with Roberts in the middle and Owens worked the bottom groove. Korte dropped to the bottom groove coming off the fourth turn on lap 13 to take the lead. Weaver moved up to keep Owens busy in a challenge for the third spot, while Korte and Roberts began to pull away. Weaver and Owens swapped the third spot twice on lap 17, but that battle was slowed by caution on lap 17 when Rogers spun for the second time in the race in turn two, right in front of the leaders. They all got by, and the restart saw Korte leading Roberts, Owens, Horton, Weaver, Beard, Lyons, Johnny Pursley of Clover, SC in the Carolina Lawn Barry Wright, Morrow and John Pursley. Buckingham drove into the top ten for the first time in the race after the restart, and settled into the ninth spot by lap 18. By lap 25, most of the drivers in the race began to settle in and take up residence in the bottom groove of the track. At the one-quarter mark of the race, Korte had pulled out to a full straightaway lead over Roberts. Korte tried the high side of the track on lap 28, but quickly found out that wasn’t the fastest way around the 1/3-mile clay oval, as Roberts and Owens closed in a hurry. Korte put his car right back in the bottom groove, and by lap 35 had pulled back out to a half-straightaway lead. Lap 56 may been the beginning of the end for Korte, as the lapped car of Phillip Cobb of Riverview, FL collided with the leader in turn two causing Korte to spin. Cobb’s Mathis Farms Rayburn was sent to the back of pack for the restart and officials gave Korte back the lead. Korte opened up a 10 car-length lead on Roberts and Owens when the field went back to green. Roberts and Owens reeled in the leader on lap 68 when Korte began to negotiate through lapped traffic, but the path was cleared for Korte on lap 73 when John Pursley and Rainey tangled on the front straightaway to bring out the caution flag. With clear race track in front of him on the restart, Korte opened back up a half-straightaway lead by lap 75. Korte’s run for his second straight Crate Racin’ USA World Championship Race win came to an end on lap 86 when he slowed on the front straightaway with a broken front suspension. As people returned to their seats after thinking Korte had the race won, Roberts assumed the lead for the restart followed by Owens, Horton, Weaver, and Beard. Owens was all over Roberts when the green light flashed on for the restart. Roberts’ car seemed to get real loose in turns three and four and Owens took to the inside to challenge for the lead. On lap 90, Owens pulled along side Roberts in turn one, as Roberts suddenly slowed off the pace. The driveshaft had fallen off the leader’s car, and he rolled to a stop in turn two. In the 11 lap dash to the finish, Horton tried to challenge Owens on the inside for the lead, and stuck the nose of his car inside Owens coming off the fourth turn on lap 98. Owens was up to the challenge, and pulled out to take a two car-length win. In Saturday night preliminary action, Rogers and White won the two 20-lap B-Main races, and Matthew Turner of Dawsonville, GA in the Turner Excavating Hicks and Roger Crouse of Plant City, FL in the Coastal Trucking Rayburn won the two 10-lap C-Main races. Tom Maddox of Armuchee , GA won the 10-lap Adams Used Auto Parts Dash to earn the 27th starting spot in the main event. On Friday night, Owens was the fast qualifier among the 74 entrants with a lap in 15.922 seconds, and then went on to win the first of six 15-lap heat races to earn the pole position for the main event. Other heat race wins went to Roberts, John Pursley, Korte, Horton, and Weaver. The 2007 StormPay.com Dirt Late Model Series National Champion David Gentry of Lewisburg , TN was disqualified of his fifth heat race win on Friday night. Gentry changed engines on Saturday morning, and StormPay.com DLMS officials tore down the engine Gentry used on Friday night. During the inspection, StormPay.com DLMS technical officials found an unapproved valve in Gentry’s engine. Gentry will be unable to defend his title in 2008, as he has been suspended from series competition for 365 days for a technical violation inside the seal of his GM Performance Crate Engine. The Crate Racin’ USA World Championship Race was the final StormPay.com Dirt Late Model Series race of the 2007 season, and the series will return in 2008 with a new title sponsor. The 2008 season opener for the NeSmith Chevrolet Dirt Late Model Series will be on January 5-6 at Talladega Short Track in Eastaboga , AL .